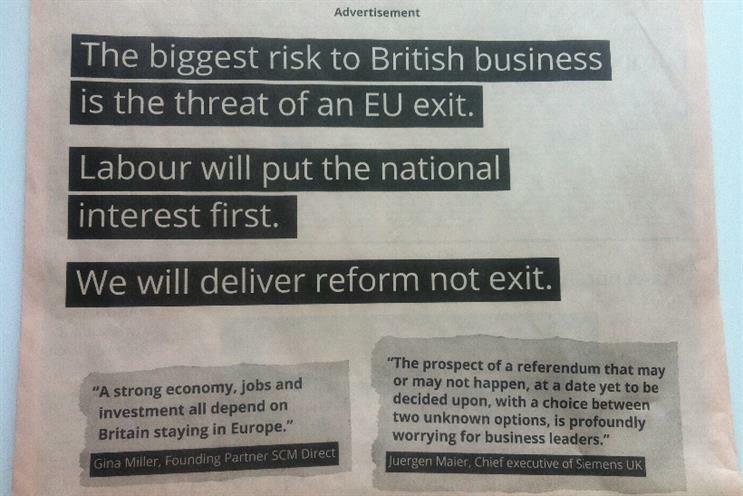 As the starting gun is fired for the general election campaign, Labour has reached out to the business community with a full-page ad in the Financial Times claiming that the "biggest risk to British business is the threat of an EU exit". The ad is a direct attack on the Conservative party which has offered to hold a referendum on EU membership by 2017. Labour’s relationship with the business community has been fraught under the leadership of Ed Miliband. In his 2011 conference speech, Miliband upset some in the world of business when he made reference to "predators and producers". More recently, Shadow Chancellor Ed Balls came in for criticism when he was unable to name business leaders backing Labour and could only remember that "Bill somebody" was a supporter of the party. Therefore, today’s ad is being seen as an attempt to show that the party understands the needs of the nation’s biggest companies. The ad says: "The biggest risk to British business is the threat of an EU exit. Labour will put the national interest first. We will deliver reform not exit." It then goes on to quote a number of British business leaders including Lovefilm co-founder Simon Franks, Kellogg’s UK and EU operations head Jonathan Myers and Siemens UK CEO Juergen Maier saying why an EU exit would be bad for Britain. Today (30 March), Prime Minister David Cameron went to the palace to ask the Queen to dissolve parliament, kickstarting what is being billed as the most unpredictable election in living memory.